This one is damaged and asymmetrical, with right lower portion of body regenerating from damage. The body of this species is about 3 cm long. The phylum Ctenophora, the comb jellies, is a phylum of marine invertebrates. They are part of the plankton, and there are also pelagic species. The phylum includes the sea gooseberry (Pleurobrachia pileus) and Venus' girdle (Cestum veneris). The phylum was grouped with Cnidaria (jellyfish) in the former Coelenterata phylum. Ctenophores are the most basal known type of animals. Even though they look like jellyfish, they are zoologically not related to them. They lack the characteristic nematocysts (stinging cells), but have colloblasts, sticky cells that snare small victims. They have eight rows of cilia which look like the teeth of a comb, hence Ctenophore = comb-bearer. Ctenophores have connective tissues and a nervous system. There are about 150 described species of ctenophora spread throughout the world's oceans, from shallow estuarine waters to the deep sea. Although there are a few benthic species, most are gelatinous zooplankton and form a considerable proportion of the entire planktonic biomass worldwide. A few species, such as the sea gooseberry, native to the North Sea, have reached such high populations that they clog fishermen's nets, while of other species only a few examples are known. The fragile makeup of ctenophores makes research into their way of life extremely difficult. For this reason their lifespan is not known, but ctenophores begin to reproduce at an early age. 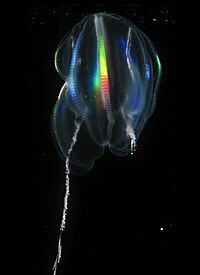 Many planktonic ctenophores produce a rainbow effect, which is not caused by bioluminescence but by diffraction, the scattering of light, as the cilia on the combs beat. Most species are also bioluminescent, but the light is usually blue or green and can only been seen in darkness. However some groups appear incapable of bioluminescence. ↑ Welch, Victoria; J P Vigneron; V Lousse & A Parker (2006). "Optical properties of the iridescent organ of the comb-jellyfish Beroe cucumis (Ctenophora)" (PDF). Physical Review E 73: 41916–7. doi:10.1103/PhysRevE.73.041916. http://perso.fundp.ac.be/~jpvigner/BioPhotonics/beroe.pdf. ↑ Haddock, S.H.D. ; Case, J.F. (1995). "Not all ctenophores are bioluminescent: Pleurobrachia". Biological Bulletin 189: 356–362. doi:10.2307/1542153. http://www.biolbull.org/cgi/reprint/189/3/356.pdf. Retrieved 2009-02-10. This page was last changed on 20 February 2017, at 14:58.